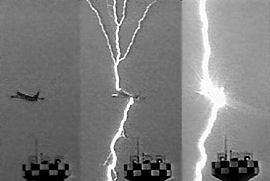 Physicists have estimated that air travelers could be exposed to a dose of X-rays, gamma rays and high-energy electrons equal to that from 400 chest X-rays if their plane happens to be near a lightning discharge. 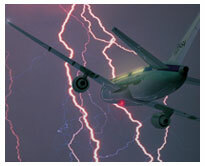 The scientists, from the Florida Institute of Technology, University of California, Santa Cruz and the University of Florida, say that commercial airplanes are typically struck by lightning once or twice a year. The scientists caution that they did not measure radiation levels directly from aircraft, instead estimating radiation based on satellite and ground-based observations of X-rays and gamma rays. The observations included those made from satellites of terrestrial gamma-ray flashes (TGFs), mysterious phenomena that appear to originate within thunderstorms at the same altitudes used by jet airliners. They also included measurements of X-rays and gamma rays from lightning on the ground, as well as artificial lightning triggered with wire-trailing rockets fired into storm clouds. 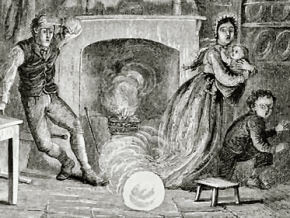 Ten rem is considered the maximum safe radiation exposure over a person’s lifetime. It is equal to 400 chest X-rays, three CAT scans or 7,500 hours of flight time in normal conditions (all airplane passengers are exposed to slightly elevated radiation levels due to cosmic rays). While the research raises concerns, the scientists caution that they don’t know how often high-radiation events occur – or how often planes are nearby enough to expose passengers and flight crews to potential danger. David Smith, an associate professor of physics at UC-Santa Cruz, said recent airborne research suggests high radiation incidents are rare. Flying aboard a research aircraft this past summer, Smith and several of the other researchers used a highly sophisticated instrument to measure gamma ray flashes from thunderstorms. Over the course of several flights, they were only able to detect one such flash, at a safe distance from the plane. 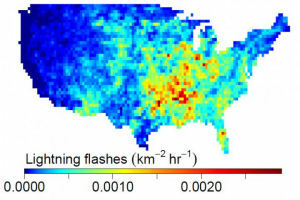 “These observations show that although thunderstorms do occasionally create intense gamma-ray flashes, the chance of accidently being directly hit by one is small,” Smith said.